Taking Roll Hardness Testing seriously - Designed specifically for the paper industry to cut costs and increase winding machine efficiency. The need for roll testing - Out of round rolls and other defects such as corrugations caused by non-uniform roll hardness profiles are a major cause of lost production for both producers and converters alike. A reliable measurement of the roll hardness profile is of critical importance in deciding whether a roll is good or bad. Production staff needs to be able to test quickly and reliably and to interpret the results as efficiently as possible. Accurate Profiling: Sensitivity and repeatability to a degree unmatched by conventional roll testers. Dedicated firmware allows instant analysis of the data on the instrument’s display. Durability: The PaperSchmidt has a vastly improved service lifetime compared with traditional instruments. Ease of use: Intuitive operator interface (displaying hardness profiles, limits, roll IDs, etc.). Automatic reloading and automatic data storage allows the fastest possible test performance. 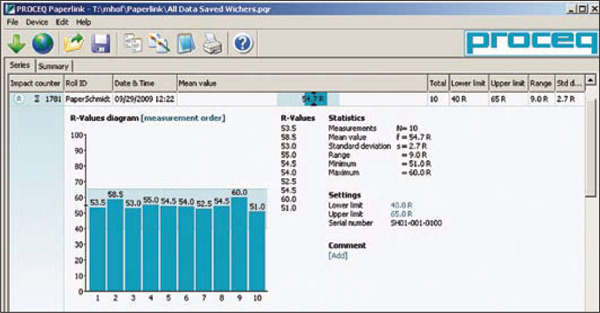 Data export and analysis: The Paperlink software provides simple tools to make a clear assessment of the results. No. of series names: 50 series names. Each name can be up to 12 characters long. PaperSchmidt is the first rebound hammer designed specifically for roll hardness testing. A new measuring principle and a high compliance plunger provide rollprofiling accuracy and repeatablility that was unachievable before now. 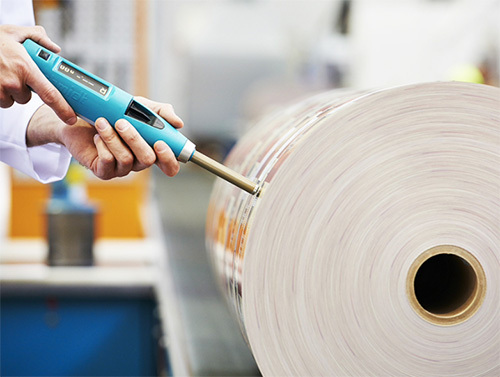 In addition to this it has an extended lifetime to cope with the heavy demands of the paper industry and dedicated tools, such as pre-defined tolerances that make assessing a profile a simple matter. The PaperSchmidt’s unique design combines the simplicity of the rebound hammer method with accuracy that was previously only achievable with much more expensive instruments and provides a lot of useful information about the roll profile. testing and download these onto the hammer. All data can be exported to third party applications. System requirements: Windows XP, Windows Vista, USB-Connector. An internet connection is necessary for automatic updates if available. An internet connection is necessary for firmware updates (using PqUpgrade) if available. PDF Reader is required to show the “Help Manual”.